The Pawtucket Red Sox received reinforcements today as GM Theo Epstein announced the signings of eight minor league free agents. Jeff Bailey, Alberto Castillo, Travis Hughes, Luis Jimenez, Joe McEwing, Ed Rogers, Kerry Robinson and Bobby Scales also received non-roster invitations to Boston's major league training camp in the spring. Castillo, a veteran of 407 major league games who spent 2006 in the Nationals' organization, had been rumored to be a candidate for the Red Sox back up catcher slot prior to the return of Doug Mirabelli and may still provide insurance in the event he falters. First basemen Bailey and Jimenez are familiar faces, having spent 2006 with the PawSox and Sea Dogs respectively. Robinson and McEwing have held major league positions in the past but would likely only be called to Boston in the event of an emergency, while Hughes, Rogers, and Scales provide for good minor league depth. The Boston Red Sox plugged two more holes Friday, announcing the signing of J. C. Romero and Doug Mirabelli. Romero, a 30-year-old free agent left handed specialist who spent 2006 with the Los Angeles Angels of Anaheim, represents a reclamation project, having put up a 6.70 ERA. Romero, who had a general run of success in Minnesota before his bumpy single season in Anaheim, reportedly signed for $1.6 million. He joins fellow southpaw Hideki Okajima in the Sox bullpen, a point of weakness for Boston in recent years. In resigning Doug Mirabelli, a familiar face to Red Sox fans, Boston has filled its back up catcher position with a known quantity, intimately familiar with RHP Tim Wakefield's signature knuckleball. Mirabelli is slated to earn $750,000 in 2007, a figure that could rise to $975,00 if he meets performance incentives. On Friday Boston bolstered its bullpen by acquiring right-handed setup man Brendan Donnelly from the LA Angels in exchange for minor league lefty Phil Seibel (pictured). In 2006, Donnelly went 6-0 with a 3.94 ERA over 62 games. Over his career, he has posted a 2.38 ERA for the Angels. Seibel had been in the Red Sox system since November 2003, but was sidelined for much of that time following Tommy John Surgery in 2005. The 27 year old lefty came back and pitched impressively in 2006, going 6-3 with a 1.24 ERA for Greenville, Portland, and Pawtucket. Seibel probably did not fit in Boston's bullpen plans for 2007, but stands a good chance of earning a spot in the Angels bullpen. Last December Scott Boras facilitated the dramatic departure of a high profile Red Sox player who wore number 18. Almost a year later, at the conclusion of an even more dramatic process, he stood by as a new #18 was introduced this afternoon at Fenway Park. Before a throng of reporters, GM Theo Epstein formally announced that the Sox have signed Japanese sensation Daisuke Matsuzaka to a six year deal, reportedly worth $52 million with $8 million in incentives. In exchange for the right to sign the 26-year-old right hander, Boston will send $51.11 million to the Pacific League’s Seibu Lions--their record high bid in the Japanese posting process. Matsuzaka boasts a robust arsenal of pitches including a mid-90s fastball, a devastating slider which has drawn comparisons to Randy Johnson’s, and has been linked with the legendary gyro-ball. In an eight year career with Seibu, Matsuzaka owns a 108-60 record, a 2.95 ERA and 1,355 strikeouts in 1,402.2 innings, going 17-5 with a 2.13 ERA in 2006. He was named the MVP of the inaugural World Baseball Classic in which he won all three of his starts while allowing only two earned runs. On a busy day in Red Sox Nation, Manager Terry Francona and Assistant GM Jed Hoyer formally introduced SS Julio Lugo today at a Fenway Park press conference. The Sox had come to terms with Lugo on a four year $36 million contract during the winter meetings, but the deal’s official announcement had been delayed pending the outcome of a physical. Hoyer and Francona were called upon to preside over the announcement in the absence of GM Theo Epstein and president Larry Lucchino, who were reportedly putting the finishing touches on a deal with Daisuke Matsuzaka. 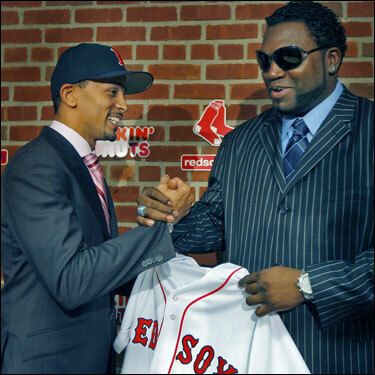 Good friend David Ortiz also was on hand to welcome Lugo. The 31-year-old with a career line of .277/.340/.402 in eight seasons will bat leadoff for the Sox in 2007 and wear uniform number 23. 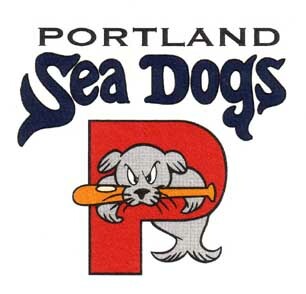 The Boston Red Sox announced today that they have filled their managerial vacancies at the Portland Sea Dogs, Greenville Drive and Lancaster JetHawks. At Portland (AA) Artie Beyeler will take over for Todd Claus, who was named 2007 Minor League Manager of the Year by Baseball America. In 2006 Beyeler served as the hitting coach for the Mobile BayBears (San Diego, AA)--where he worked with George Kottaras--and most recently coached under Claus for the West Oahu CaneFires in the Hawaiian Winter League, whose members included Red Sox prospects John Otness, Jeff Corsaletti, and Ryan Phillips. Beyeler previously managed in the Red Sox system at Lowell (2000-2001 seasons) and Augusta (2002). As had been previously announced, Claus will remain with the Red Sox as an advance scout. Red Sox fan favorite Gabe Kapler announced his retirement as a player Tuesday night, but was not out of work long, as he was offered and accepted the managerial position of the Greenville Drive (low-A). Kapler replaces another former big leaguer, Luis Alicea, who had been promoted to the Red Sox first base coach and infield coach. Chad Epperson, who had managed the Wilmington Blue Rocks, will move with the Sox to Lancaster where he will take the reigns of the JetHawks (high-A). Epperson was named BA’s Carolina League top managerial prospect in 2006 and led the Drive to the playoffs. He is in his sixth season in the Boston system, having previously managed at Augusta and Greenville. As has been widely reported, the Boston Red Sox announced the signing of Japanese free-agent LHP Hideki Okajima on Nov. 30, 2006. Okajima, a 30-year-old reliever, signed a two-year reportedly $2.5M deal, with a $1.75M team option for a third. In 2006 Okajima went 2-2 with a career best 2.14 ERA and four saves in 55 appearances for the Pacific League champion Hokkaido Nippon Ham Fighters. Okajima's arsenal of pitches includes a "plus" curve, a fastball and a fork ball. The new Sox lefthanded specialist had a cumulative record of 34-32 with a 3.36 ERA and 41 saves in his twelve year Japanese career. "Okaji," as he has asked to be called, will wear number 40. Check out MILB.com's interview with top prospect Jacoby Ellsbury. 11/17 Cup of Coffee: The Javelinas won their final game of the Arizona Fall League by defeating Scottsdale 1-0. This gave them an overall record of 14 wins and 18 losses for the short fall season. This saw them finish in last place in their division. Jacoby Ellsbury went 2 for 3 in the game with a run scored. He finished with a .276 batting average. Chad Spann went 0 for 3 in the game and ended up hitting .268. Dusty Brown did not play. He finished up hitting .239. David Pauley started and went 3 innings in the game. He did not allow a run while giving up 3 hits and 0 BB. He had 3 Ks. Overall he was 0-3 with an ERA of 5.06. He had 14 Ks in 23 2/3 innings. Lenny DiNardo pitched 1 scoreless inning of relief. He allowed 1 hit and 0 BB while striking out the side. Overall, he was 1-0 with a 2.70 ERA. He had 16 Ks in 13 1/3 innings. Kyle Jackson finished with a 6-0 record and an ERA of 6.23. He had 11 Ks in 17 1/3 innings. Barry Hertzler finished with a record of 1-0 and an ERA of 3.31. He had 17 Ks in 16 1/3 innings. See you in the spring! 11/16 Cup of Coffee: In their second to last game of the fall season, the Javelinas bats came alive as they trounced Phoenix 11-0. Chad Spann had a big night at the plate going 4 for 5 with a run scored and a RBI. He raised his overall batting average to .278. Dusty Brown went 1 for 4 with a BB. He is now hitting .239. Kyle Jackson improved his record to 6-0 with a 2 inning scoreless performance. He allowed just 1 hit, 0 BB and had 3 Ks. The Javelinas play their final game of the fall season tonight. 11/15 Cup of Coffee: Action in the Arizona Fall League yesterday saw the Javelinas drop a 6-5 decision to the Saguaros. Jacoby Ellsbury went 2 for 4 and scored a run. Dusty Brown went 0 for 3 with a BB and a run scored. With a record bid the Boston Red Sox won the rights to negotiate with Japanese star pitcher Daisuke Matsuzaka. The Red Sox bid of $51.1 million easily topped the previous record of $13.125 million for Seattle outfielder Ichiro Suzuki. The 26 year old right hander was 17-5 with a 2.13 ERA for the Seibu Lions of Japan's Pacific League in 2006. Now the Red Sox have 30 days to finalize a deal with Matsuzaka or risk the return of the Japanese ace to the Seibu Lions for the 2007 season. 11/14 Cup of Coffee: The Javelinas defeated Grand Canyon 5-2 on Monday. Jacoby Ellsbury was hitless in 5 at bats and saw his average drop to .255. Chad Spann went 1 for 4 and scored a run. Dusty Brown went 1 for 4 with a triple being his hit. Barry Hertzler went 3 hitless innings. He gave up 1 BB and had 4 Ks. Lenny DiNardo went 1 inning. He did allow a run. He gave up 1 hit and had a K.
11/12 Cup of Coffee: Saturday's action saw the Javelinas defeat Mesa 13-10. Chad Spann went 1 for 4 with a run scored and a RBI. He also had a BB. Dusty Brown went 1 for 3 and had a RBI. He had 2 BBs as well. Kyle Jackson pitched 1 inning of relief. He allowed 4 runs on 4 hits and a BB. 11/11 Cup of Coffee: Grand Canyon defeated the Javelinas 4-2 on Friday. David Pauley started and took the loss. His record is now 0-3. He went 4 2/3 innings giving up 4 runs on 8 hits. He did not walk a batter and had 2 Ks. Jacoby Ellsbury went 0 for 4 and is now hitting .269. Chad Spann also went 0 for 4 and saw his batting average drop to .242. Dusty Brown went 2 for 4 and had an RBI. His average is now .245. 11/10 Cup of Coffee: On Thursday, the Javelinas were shutout 8-0 by Grand Canyon. Jacoby Ellsbury went 1 for 4 and is now hitting .281. Dusty Brown entered the game as a pinch hitter and was 0 for 1. He is hitting .224. Barry Hertzler pitched 1 1/3 innings of relief. He did not give up a run on 3 hits and a BB with 3 Ks. 11/09 Cup of Coffee: Kyle Jackson pitched 2 innings of perfect relief with 2 Ks in the Javelinas 10-6 win over the Saguaros. He was credited with the win and his record in the AFL is now 5-0. Jacoby Ellsbury went 3 for 5 and scored a run. Chad Spann went 0 for 3 but had 2 BBs. He also scored a run. 11/08 Cup of Coffee: In a battle between the two Peoria teams the Saguaros defeated the Javelinas 5-2. Jacoby Ellsbury went 0 for 5 while scoring a run. Chad Spann went 1 for 4. He scored a run and also reached base with a BB. Dustin Brown went 1 for 4 and had an RBI. Lenny DiNardo went 1 2/3 innings allowing 1 run on 1 hit and a BB. 11/07 Cup of Coffee: The Javelinas were shutout by Phoenix 5-0 on Monday. Jacoby Ellsbury went 0 for 4, Chad Spann went 0 for 3 and Dusty Brown also went 0 for 3 in the game. Barry Hertzler pitched 1 shutout inning of relief. He allowed a hit and a BB. He had 1 K.
11/05 Cup of Coffee: On Saturday, the Javelinas were shutout 6-0 on just 3 hits by Phoenix. Jacoby Ellsbury went 0 for 4 while Dusty Brown also went hitless going 0 for 3. David Pauley started the game and took the loss. He went 4 innings giving up 1 run on 3 hits and a BB. He had 3 Ks. The Javelinas find themselves in last place in their division with a record of 9-13 and 3 games behind division leader Grand Canyon. 11/04 Cup of Coffee: Jacoby Ellsbury went 2 for 5 with 2 runs scored and an RBI in the Javelinas 9-4 win over the Saguaros on Friday. Sox prospect Kyle Jackson got the win in relief after blowing the save. He went 1 inning giving up 2 runs on 3 hits. He had 1 K. His record in the Fall League is now 4-0. 11/03 Cup of Coffee: The Javelinas scored a 8-1 win over Mesa on Thursday. Dusty Brown went 1 for 3 with a BB. Two Sox pitchers combined for 2 scoreless innings of relief. Lenny DiNardo threw a perfect inning with 2 Ks. He threw 11 pitches in the inning, ten of which were strikes. Barry Hertzler also threw a scoreless inning of relief. He did not allow a hit but gave up a BB. 11/02 Cup of Coffee: Jacoby Ellsbury went 2 for 5 with a double and 2 runs scored in helping the Javelinas to a 6-3 win over Mesa. He is now hitting .306. Chad Spann was the only other Sox prospect to see action in the game. He went 0 for 2 with a BB. Slumping a bit, he has seen his average in the Fall League drop to .288. 11/01 Cup of Coffee: The Javelinas were edged 7-6 by Scottsdale in 11 innings. Jacoby Ellsbury went 0 for 6 in the game. Chad Spann went 1 for 5 with a run scored and an RBI. Dusty Brown went 1 for 5 with an RBI. Kyle Jackson pitched 2 scoreless innings of relief. He allowed 1 hit while giving up 1 BB and striking out 1. 10/31 Cup of Coffee: Jacoby Ellsbury went 2 for 2 with 3 BB in last light's 12-3 win for the Javelinas over Scottsdale. He also scored 3 times. Dusty Brown went 2 for 5 , scored 2 runs and had a homer. David Pauley got the start and went 4 innings. He gave up 1 run on 3 hits. He did not walk a hitter and struck out 1. Lenny DiNardo got the win going 2 scoreless innings. He did not allow a hit, walked 1 and had 3 Ks. Barry Hertzler went 1 inning allowing 1 run on 2 hits and a BB. He had a K.
10/29 Cup of Coffee: In the first game following the League's Fall Showcase game, the Javelinas lost 3-2 in 10 innings to Grand Canyon. Chad Spann, who played as the DH, went 0 for 4 with a BB. Jacoby Ellsbury, who went 1 for 4 in the All Star game, entered the game as a pinch runner and was caught stealing. These were the only Sox prospects to see action in the game. 10/27 Cup of Coffee: The Javelinas snapped their eight game losing streak with a 7-3 victory over the Mesa Solar Sox. Chad Spann went 2 for 5 with a RBI. Jacoby Ellsbury went 1 for 5. Dusty Brown was 0 for 1 with a BB and a run scored. Kyle Jackson got the win and his record is now 3-0. He threw 2 innings and gave up 1 run on 1 hit and 3 BBs. He had 1 K. Two Sox prospects have been chosen to participate in the AFL Showcase Game. They are Jacoby Ellsbury and Lenny DiNardo. One has to wonder if these selections were based on reputation rather than performance as it seems unfair that Chad Spann was not included on the roster. He is now hitting .359 with a .400+ OBP and a 1.000+ OPS. 10/26 Cup of Coffee: For the eighth straight contest, the Javelinas went down in defeat. This time the score was 23-9 to Phoenix. No regular Sox prospect postion players saw action in the game. Barry Hertzler pitched 1 1/3 innings of relief allowing 1 run on 1 hit and a BB. Lenny DiNardo retired the only batter he faced. 10/25 Cup of Coffee: Jacoby Ellsbury went 3 for 4, had a BB and scored a run in a losing cause as the Javelinas were defeated for the seventh consecutive game dropping a 12-6 decision to Scottsdale. Ellsbury is now hitting .318 with 14 hits in 44 AB. His OBP is .379 and his OPS is .797. Chad Spann went 1 for 4 and scored a run. He is now hitting .353 with an OBP of .405 and an OPS of 1.023. He also has 6 extra base hits. Dusty Brown went hitless in 3 at bats. He had a single BB. He is now hitting .250 with an OBP of .357 and an OPS of .617. Kyle Jackson pitched 1 inning of relief. He gave up 4 runs on 3 hits and a BB. 10/24 Cup of Coffee: The Javelinas were out hit 11-6 and out scored 4-2 by Grand Canyon on route to their sixth straight loss. David Pauley got the start and went 4 innings. He gave up just 1 run on 6 hits and 3 BBs. He had 1 K. Jacoby Ellsbury went 1 for 3 with a BB. He also had a stolen base. Dusty Brown went hitless in 4 at bats. 10/22 Cup of Coffee: Barry Hertzler threw 2 hitless innings of relief in a losing cause yesterday as the Javelinas lost their fifth straight game 6-4 to the Saguaros. He allowed 1 BB and had 1 K. Lenny DiNardo went 1 2/3 innings without allowing a run. He gave up 3 hits and a BB. He had 1 K. Dusty Brown went 2 for 4 with a run scored. He is now hitting .353. Chad Spann went 0 for 3 with a BB. He saw his average drop to .367. 10/21 Cup of Coffee: The Javelinas took a 9-6 lead into the bottom of the eighth inning yesterday but gave up 5 runs to lose their fourth straight game by the score of 11-9. Jacoby Ellsbury was the only Sox prospect to start the game. He went 3 for 5 with a run scored and an RBI. He is now hitting .270. Kyle Jackson pitched 1 1/3 innings of relief. He did not allow a run on 3 hits. He did not walk a batter and had a K.
10/20 Cup of Coffee: Phoenix shut out the Javelinas 6-0 yesterday. Dusty Brown went 2 for 3 to raise his average to .308. Jacoby Ellsbury went 1 for 4 and is now hitting .219. Chad Spann went 0 for 4 and saw his average drop to .407. Barry Hertzler was the only Sox prospect to see action on the mound. He threw one perfect inning of relief and struck out the side in the process. 10-19 Cup of Coffee: The Javelinas lost yesterday to Phoenix by a score of 9-6. Chad Spann went 2 for 4 with a BB and a home run. Dusty Brown was 1 for 3 with a BB, 2 runs scored and an RBI. Lenny DiNardo pitched a perfect inning of relief with 1 K.
10-18 Cup of Coffee: The Javelinas fell 14-9 to Mesa in action yesterday. Jacoby Ellsbury went 1 for 4 with a triple and 2 runs scored. He is now hitting .214. Chad Spann continued to swing a hot bat going 2 for 5 with a double and 2 RBI. He is hitting .474. David Pauley started and lasted 4 innings. He allowed 3 runs on 4 hits and a BB. He had 2 Ks. Barry Hertzler pitched 1 1/3 innings of relief giving up 5 runs on 7 hits and a BB. 10/17 Cup of Coffee: In action on Monday, the Javelinas defeated Mesa 11-4. Kyle Jackson pitched 3 innings giving up 1 run on 3 hits and a BB. He had 2 Ks. He also picked up credit for the win. Jacoby Ellsbury had his first multiple hit game going 2 for 6. He scored a run and had a triple. David Laurila of Red Sox Nation interviews 2006 Red Sox draft pick Travis Beazley. In action on Saturday, the Javelinas pounded out 16 hits on route to a 15-7 victory over Scottsdale. Chad Spann was the only Sox prospect to start the game. He went 2 for 5 with a triple. He scored 2 runs and had 3 RBI. After missing almost the last two months of action with the Sea Dogs, he has started the fall season very strong and is 7 for 14 with a 1.319 OPS. Barry Hertzler pitched 2 perfect innings of relief and was credited with the win. He had 3 Ks. The Javelinas, behind Chad Spann's game winning double in the tenth inning, edged the Saguaros 9-8 in AFL action yesterday. Spann was 4 for 5 for the game with 2 doubles, a run scored and 2 RBI. Jacoby Ellsbury was 1 for 6 with a run scored while Dusty Brown went 0 for 3. Lenny DiNardo pitched 2 innings of relief giving up 3 runs on 3 hits and 2 BBs. He had 3 Ks. Kyle Jackson got the win pitching 1 inning allowing 0 runs on 1 hit and 2 BBs. The Peoria Javelinas outslugged the Peoria Saguaros yesterday 17-15. Jacoby Ellsbury was the only Sox prospect to see action. He went 1 for 4 with an RBI from the leadoff spot. After three games he is batting .167. In action yesterday, the Javelinas dropped their second game of the fall season falling 9-2 to the Grand Canyon team. David Pauley started and went 3 innings giving up 5 runs on 9 hits and 2 BBs. He had 2 Ks. Kyle Jackson threw 1 inning of relief giving up 0 runs on 1 hit and a BB. Jacoby Ellsbury went 1 for 4 with a BB. He scored a run. Chad Spann and Dusty Brown were each 1 for 4. In the Javelinas first game of the season they also fell to Grand Canyon by the score of 12-6. Lenny DiNardo pitched 1 2/3 innings of relief giving up 2 runs on 3 hits. He did not allow a walk and had 2 Ks. Barry Hertzler pitched 1 1/3 innings. He gave up 2 runs on a hit and a BB. He had 1 K. Jacoby Ellsbury went 0 for 4 in the opener. If you're thirsty for Red Sox prospect info this off-season, check out the SoxProspects.com Wiki. The Wiki is a vault of Red Sox minor league info including bonus information, minor league free agents, a 2007 Draft Watch, a Top Prospect list, plus a lot more. The Wiki format allows the SoxProspects community to contribute info and update for accuracy, and you don't even have to sign up to contribute. Check out David Laurila's interview with Sox Director of Player Development Mike Hazen. Hazen discusses the new A-ball affilate in Lancaster, Justin Masterson becoming a starter, as well as some thoughts on Bryce Cox, Jed Lowrie, and others.